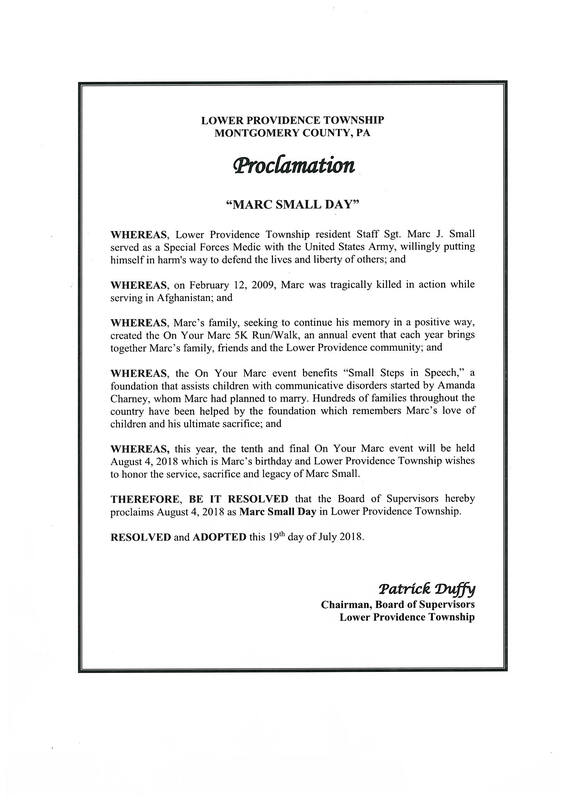 The Board of Supervisors of Lower Providence Township, PA have issued a proclamation declaring August 4, 2018 “Marc Small Day” to honor the sacrifice and legacy of Staff Sgt. Marc Small, a Lower Providence Township resident who was killed in action in Afghanistan. The date marks the tenth and final “On Your Marc” 5k Run/Walk event that is held in his memory and this year falls on Marc’s birthday. We at Small Steps in Speech are humbled by this very special tribute and we are delighted to honor Marc’s life and share his story with the community on August 4th. Visit lptrec.com to sign up for this special community event.